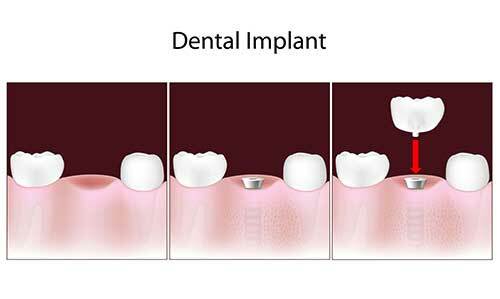 Dental Implants are a great advancement in dentistry as they permanently replace missing teeth in a way that no previous dental technique was able to accomplish. 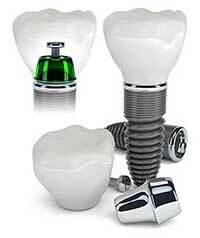 Implants are anchors made out of the strongest titanium materials, that are implanted into the bone and then covered with a cap or denture. They are stronger than a natural root and will never require a root canal or filling. An implant will help maintain the health and shape of the bone in the jaw area, and neighboring teeth do not need to be filed down to make room for it. It is imperative that the dentist performing the implant be experienced and skilled in all the proper techniques of implant dentistry. When done successfully, an implant will result in a comfortable and natural looking tooth, thereby providing a permanent solution to a missing tooth. © Copyright Bright Smile Dental Care, LTD. All Rights Reserved. Accessibility Policy.